Canada’s oldest penitentiary opened on June 1, 1835, under the name “Provincial Penitentiary for Upper Canada.” Located in Portsmouth, now part of Kingston, this institution was designated for the incarceration of prisoners from both Upper Canada and Lower Canada. Kingston Pen, as it is commonly known, closed its doors on September 30, 2013.
Who were the inmates over the course of the penitentiary’s 178 years of existence? To discover their stories, consult the Kingston Penitentiary inmate history description ledgers, which have been digitized and can be viewed on the Library and Archives Canada (LAC) website. 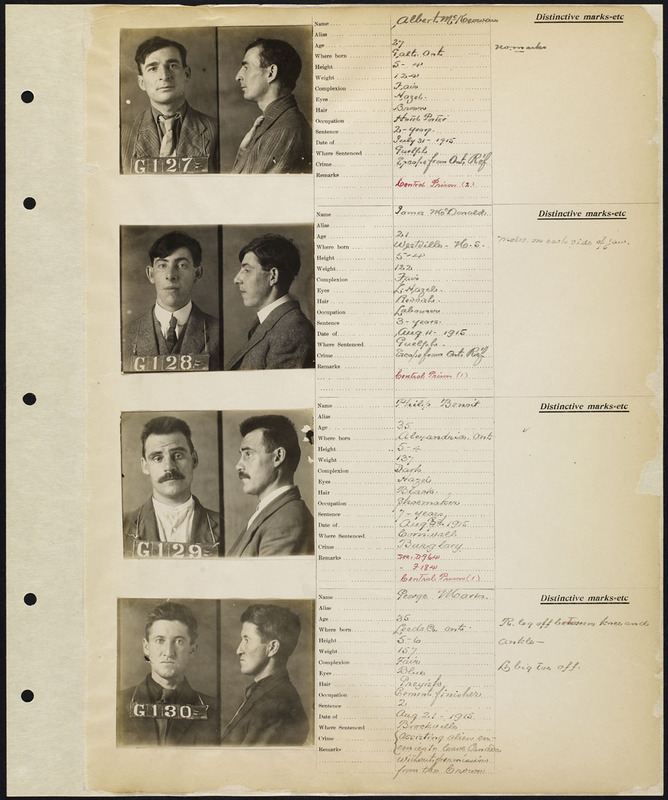 The ledgers provide photographs (mug shots) of inmates and information such as name; alias; age; place of birth; physical description; occupation; crime committed; and date, place and length of sentence. To find the pictures of some of the inmates who were incarcerated at the Kingston Penitentiary, search for a person’s name in the Archives Search menu. On the left of the screen, under Archives Search, click on the Advanced option. The advanced search screen will appear. Type the word Kingston in the first search box, leaving the default “Any Keyword” in the drop-down menu. In the second search box, type the surname of the inmate, leaving the default “Any Keyword” in the drop-down menu. From the Type of material drop-down menu, select Photographic material. From the Online drop-down menu, click on Yes, then click on Submit. Your search will generate a list of results. Select an underlined title to access the full description of the photograph. The descriptive records display images of photographs that have been digitized. Census returns, the official record of the population of Canada, also list the inmates who were incarcerated at the time of the census enumeration. In addition, nominal indexes can be searched for a reference to an inmate’s name. Remember that spelling variations are common. Search for books on the Kingston Penitentiary and other Canadian penitentiaries in AMICUS using the author’s name, the book title, or subject keywords such as Kingston (or name of the city), penitentiary, prisons and criminals. This entry was posted in Digitization, Our Collection and Facilities and tagged Census, digitization, Inmates, Kingston Penitentiary, Notorious Criminals by Library and Archives Canada Blog. Bookmark the permalink.